Two American School of Puerto Vallarta students earned AP Scholar Awards by the College Board in recognition of their exceptional achievement on the college-level Advanced Placement Program (AP) exams this past year. The College Board’s Advanced Placement Program offers students the opportunity to take challenging, college-level courses, while still in high school. They can receive college credit, advanced placement, or both, for successful performance on the AP exams in most top universities in the United States and Canada as well as Mexico. Only about 18% of the more than a million students taking AP exams performed at a sufficiently high level to merit recognition as AP Scholars. The AP exams are graded on a five-point basis; a passing grade is a 3 and the highest score possible is a 5. 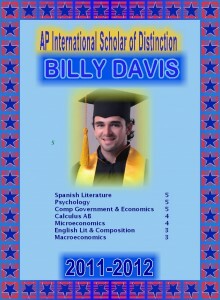 William (Billy) Davis was designated as an AP International Scholar of Distinction, Granted to the one male and one female student attending a school outside the United States and Canada that is not a Department of Defense school with the highest average score on the greatest number of AP Exams. Billy took 7 AP classes in High School, and passed every single one. Matthew Canil qualified for the AP Scholar Award by earning a grade of 3 or higher on three of these exams. Our mission at the American School is to motivate our students to give their best effort in search of excellence. Over the years we have offered various AP courses, including English Literature and Composition, Spanish Literature and Composition, Macro- and Microeconomics, Comparative Government & Politics, Statistics, Spanish Literature, Calculus, Psychology, and Studio Art 2-D design. We were able to offer 7 different AP courses last year! Billy is beginning his freshman year at the University of California in San Diego (UCSD) in their biomedical engineering program. UCSD is ranked no. 2 in the United States in this field! 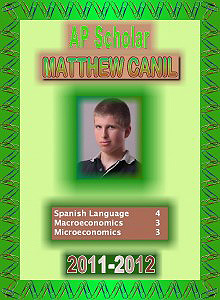 Matthew is a senior this year, taking AP Calculus AB, AP Comparative Government & Politics and AP Spanish Literature.